Drones have numerous applications in security, inspection, and other major roles at industrial facilities, but in many cases manual control is still the standard. Tel Aviv-based Airobotics aims to automate the process as an alternative to costly and involved human pilots, and has raised $28.5 million to do so. The company’s solution is to provide hardware and software focused on needs specific to industry — this isn’t a drone for filming concerts or monitoring brush fires, it’s for on-location missions like perimeter patrols and regular safety inspections. Of course, humans do that stuff now for the most part. But if a drone can take temperature readings of vents from 50 feet out, and check all of them every hour, why employ a full-time worker? Well, actually, because at some point you need to have human involvement — but it doesn’t need to be quite so hands-on all the time. It’s okay to get a little help from the robotics world. To that end, inspections may be conducted by the drone, but they’re launched and monitored by facility staff. Airobotics’ innovation is in an easy to use software platform where missions can be created, edited, and recorded — and hardware that ties in closely. The Optimus drone is equipped with a swappable payload and battery, giving it the possibility to check fences for gaps during the day and watch for heat signatures at night during its 30-minute flights. 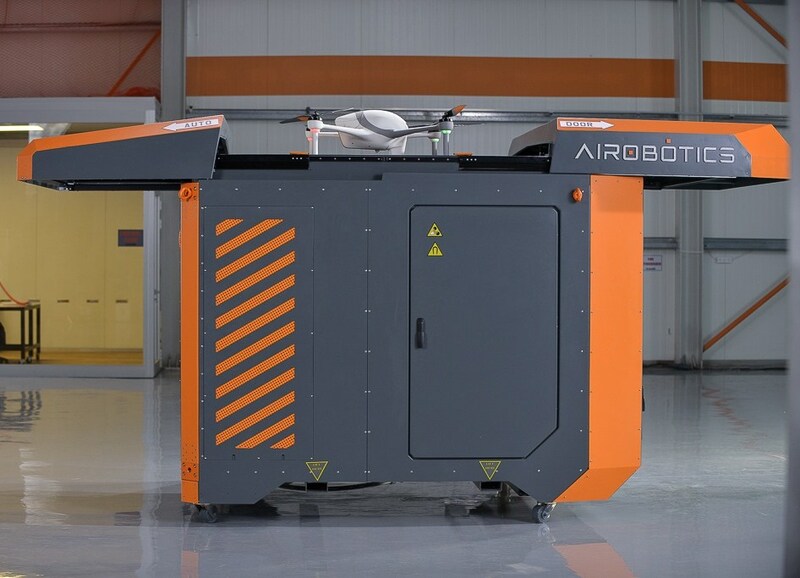 It autonomously takes off and lands from the Airbase platform, something about the size of a dumpster that contains the drone’s spare batteries and modules. It’s gone through beta at Israel Chemicals Ltd, a major producer of various minerals and chemicals; the company gives Airobotics a glowing review, citing quicker inspection times, among other things. The $28.5 million is a combined A and B round, with the A led by BlueRun Ventures and the B by CRV. Israel Chief Scientists, UpWest Labs, Waze CEO Noam Bardin, and Google ATAP COO Richard Wooldridge also contributed. So far the company, founded by Ran Krauss (now CEO) and Meir Kliner (VP of R&D), has 70 employees. The system looks impressive, but Airobotics is up against major players in autonomous and roboticized drone platforms; serious competitors will almost certainly be found in the likes of existing consumer and professional drone companies like DJI. The pot is just too sweet for the others to let a tiny company like Airobotics dominate it. All the same, it looks like a strong early entry; we look forward to hearing news of Airobotics deployments in the future.